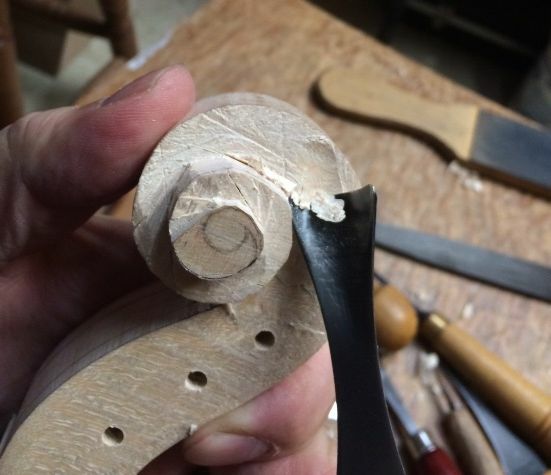 I had removed most of the rough wood, in the last post, and had smoothed the outside of the turns of the scroll. 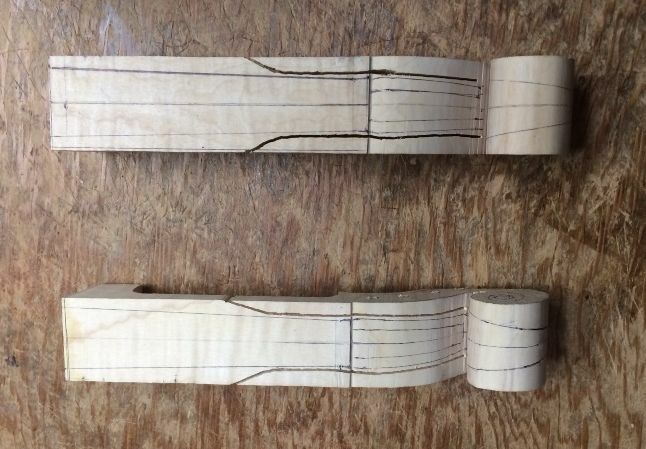 Now it is time to undercut the turns of the scroll so that they have a more delicate look, and are physically a little lighter. 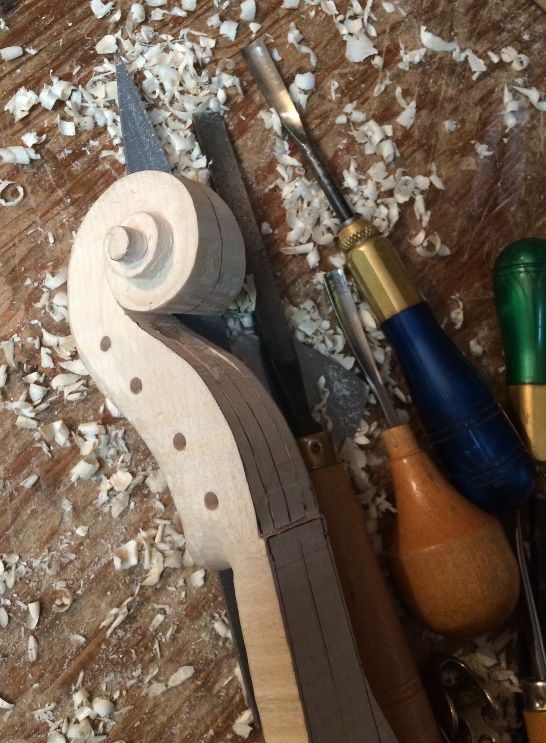 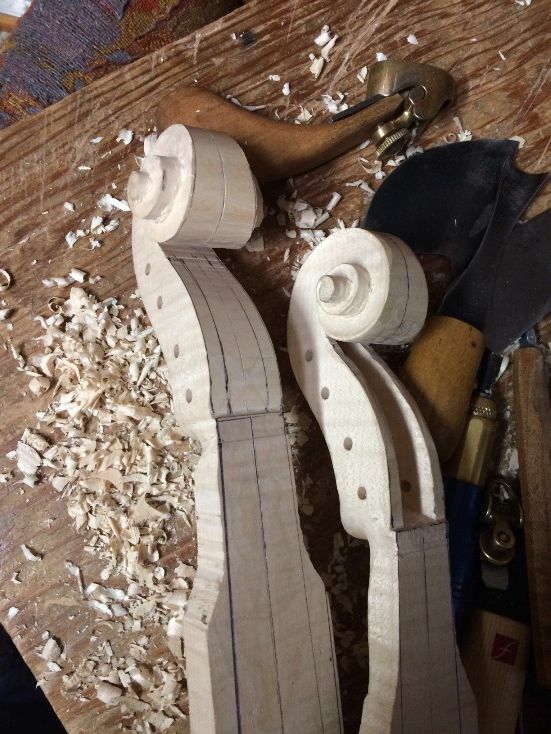 Carving the volute and neck. 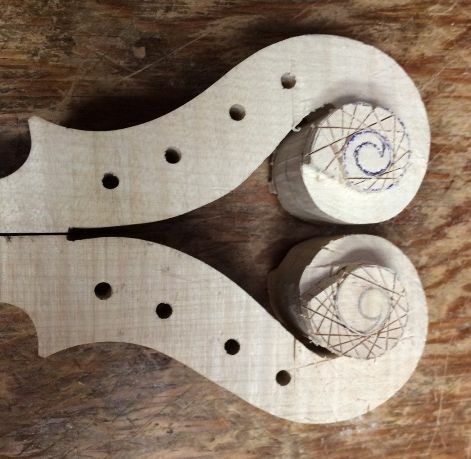 Completing the volute and pegbox. 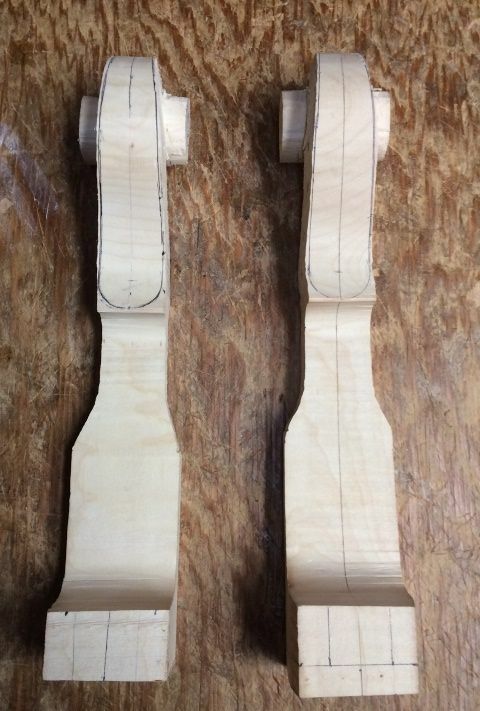 So, at this point the one scroll is essentially done, and the other will soon be done as well. 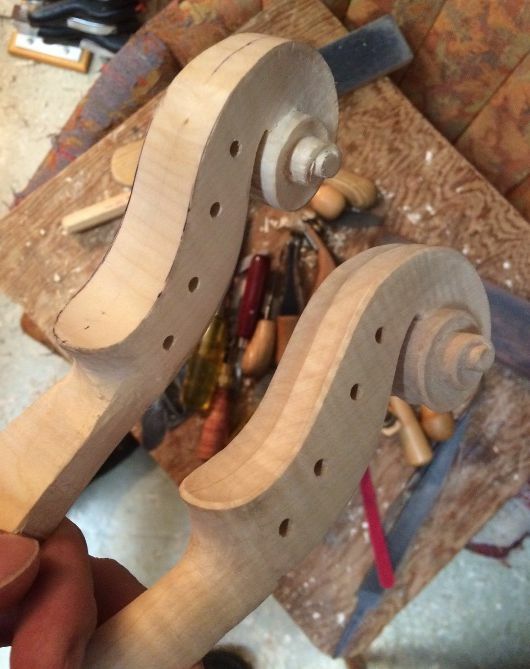 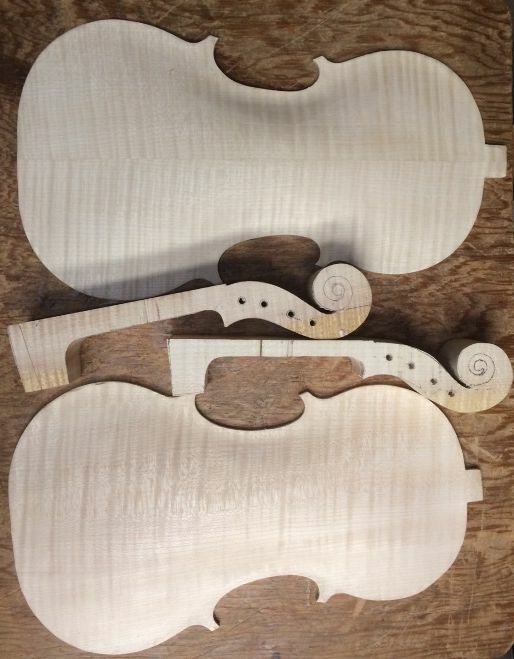 I will complete the purfling on the two instruments before setting the necks, so that is next. 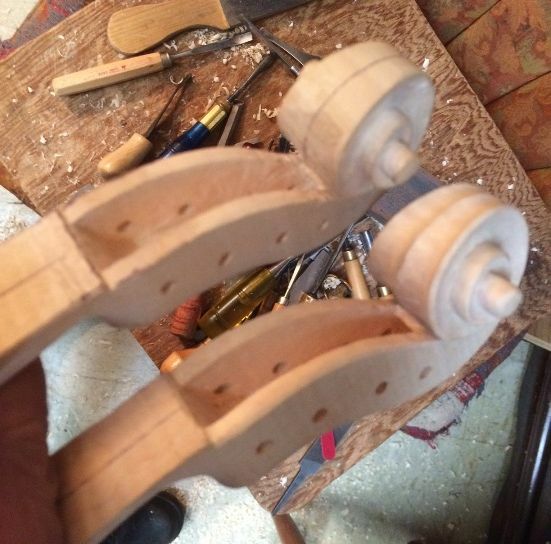 Here are the back plates: the arching is complete, but the graduations are not begun…inside surface is still flat. 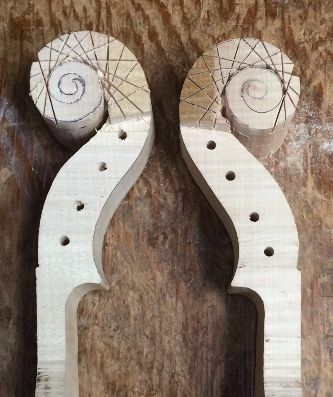 The two scrolls have only been cut out, for the rough profile. 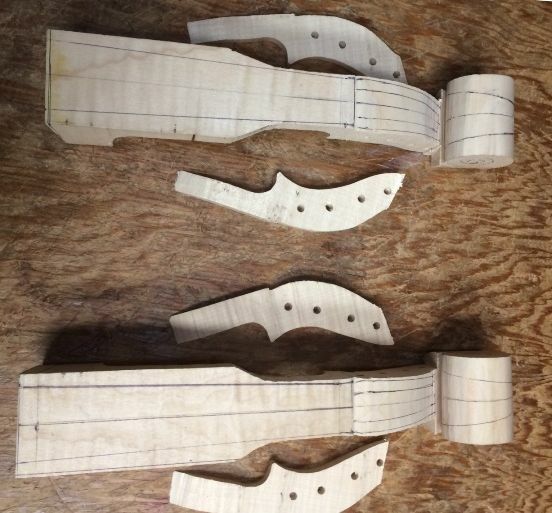 I did lay out and drill pilot holes for the tuning pegs. 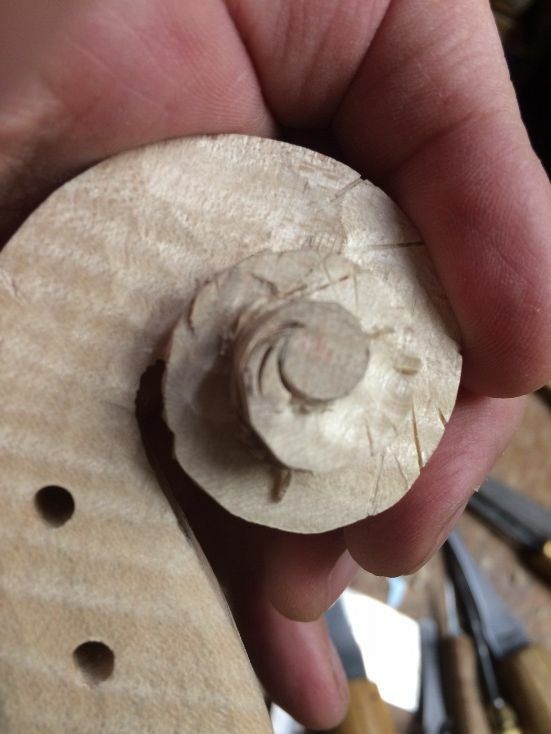 That will make it easier than trying to drill them after the outer shape is completed. 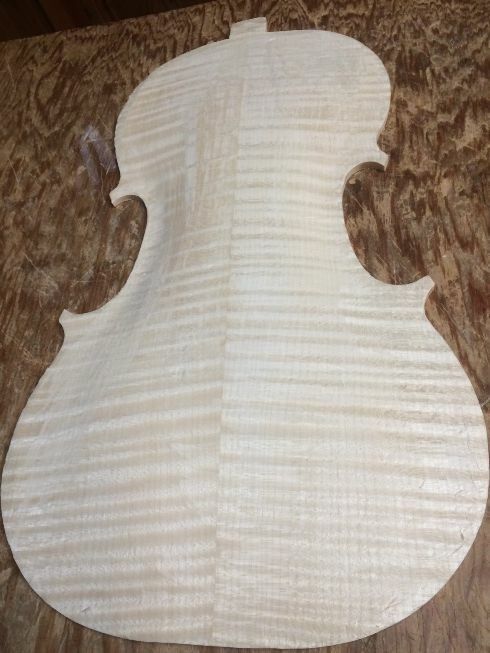 At this point the sides are relatively flat. 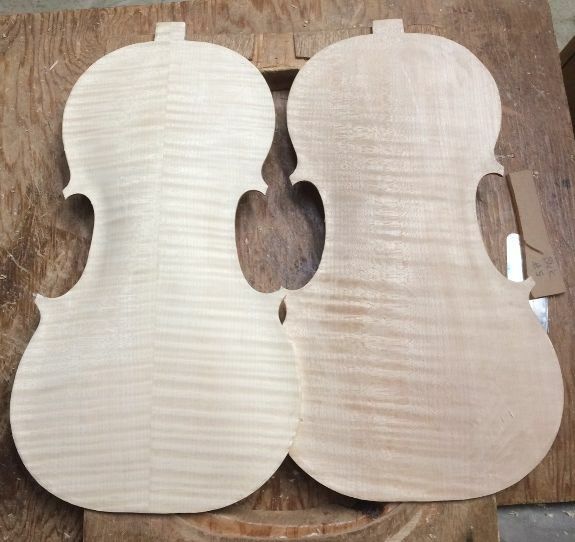 Two back plates, nearly complete: two scrolls, just begun. 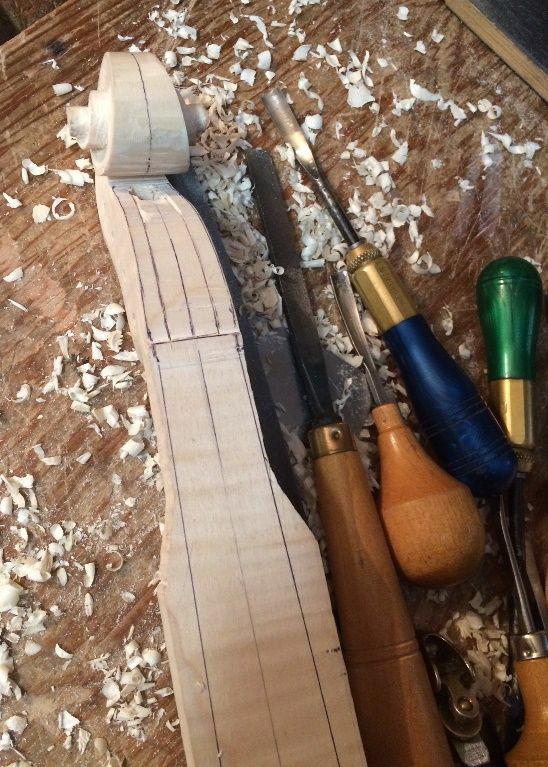 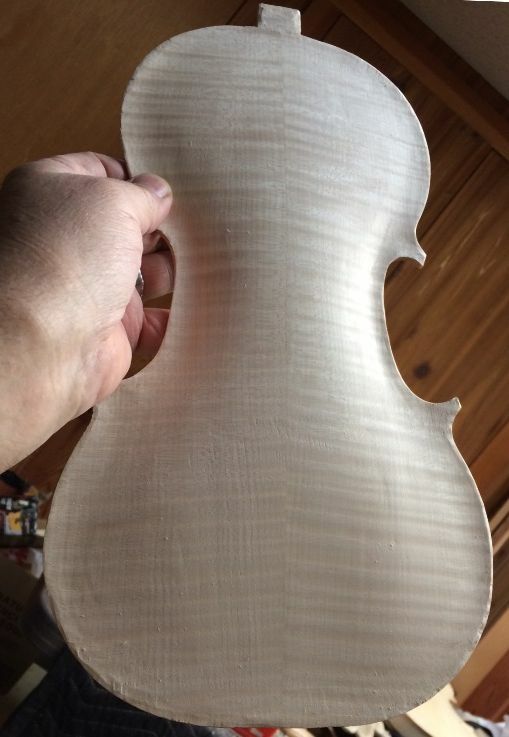 Beginning to cut out the neck/scroll combination, using a saw. 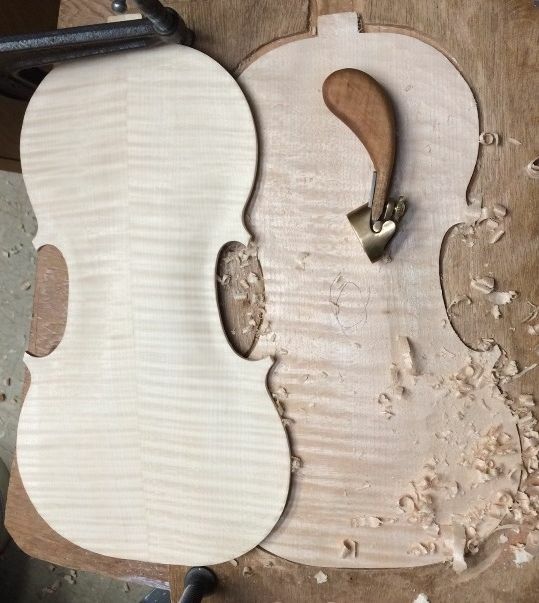 Removing the excess wood from the sides. 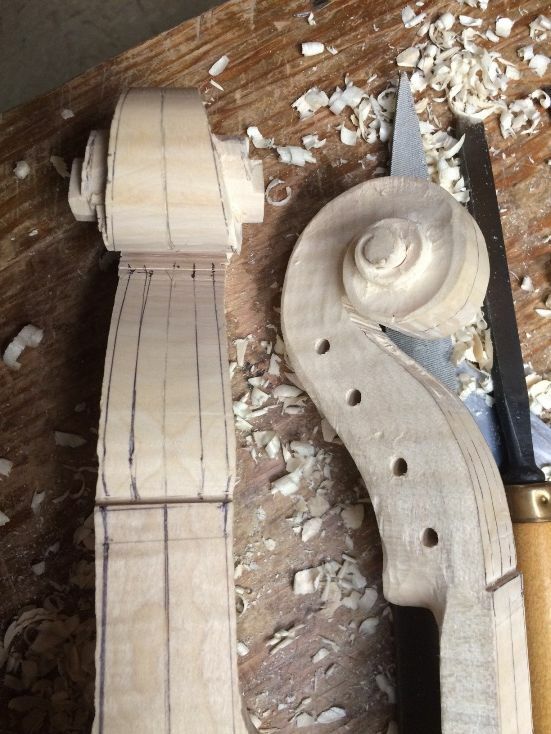 Cutting to the layout lines, all around the scroll, from both sides. 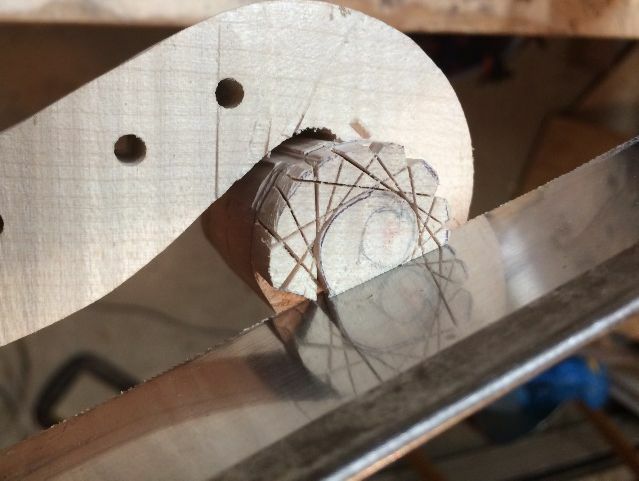 Continuing around the first turn of the scroll. 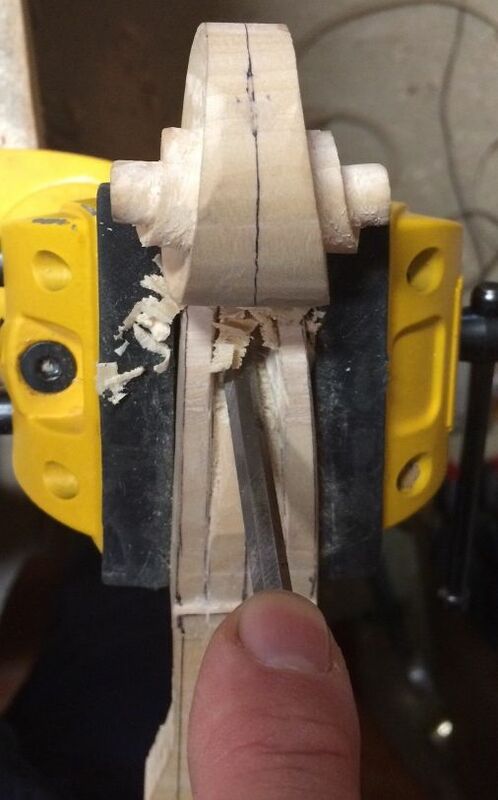 Cuts completed around the first turn of both scrolls. 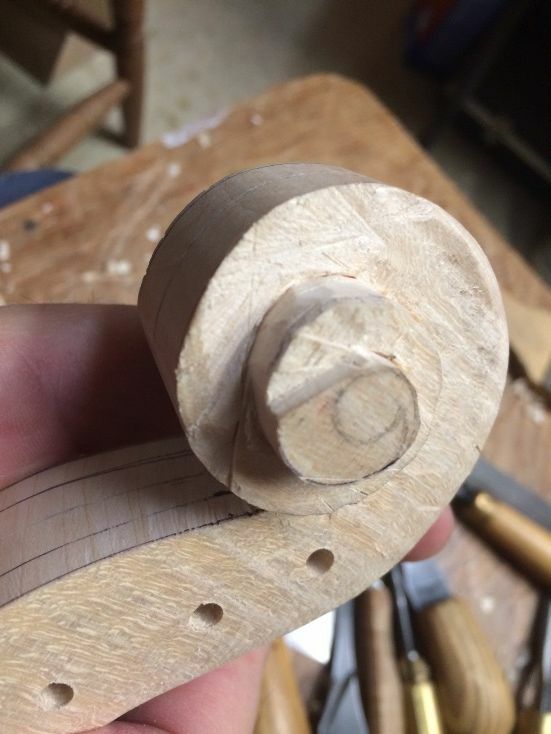 Excess wood removed from first turn on both scrolls. 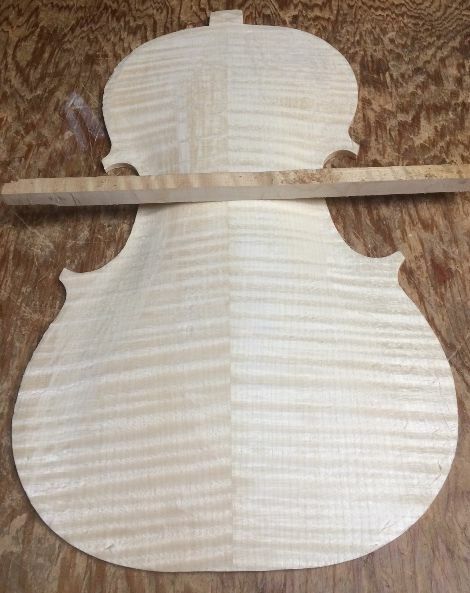 Back view with first turn wood removed. 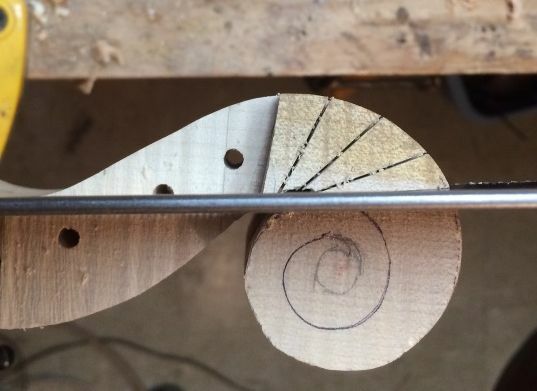 Completing the scond turn of the scroll, using a fine-toothed pull-saw. 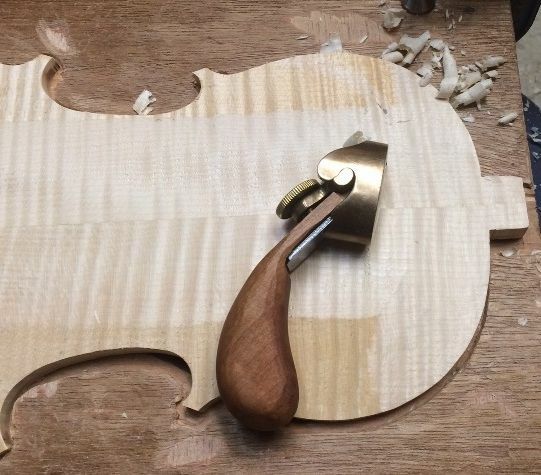 The remaining wood will be removed using gouges, planes and scrapers, There is still a long way to go, but it does look more encouraging, this way. 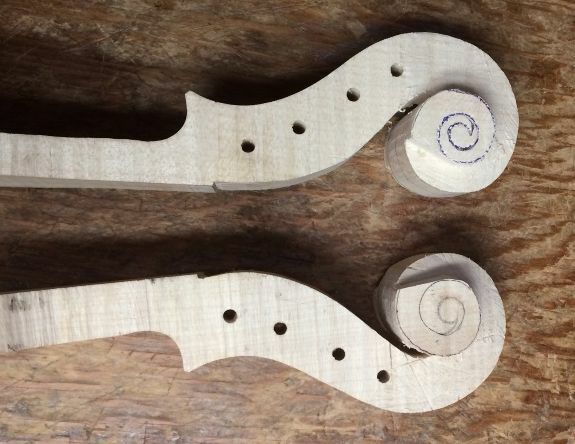 Next time we will be carving the pegboxes and scrolls.